In 2018, the Media Relations Department at Fractl earned over 1,135 placements—this amounts to over 41,545 press mentions and over a million social shares. After years of being recognized as a source for news stories across all verticals, we know that building relationships with journalists is key to delivering results to our clients. Over the years, our team has collected feedback from journalists on our content campaigns. The department uses these responses to identify trends in publisher feedback. 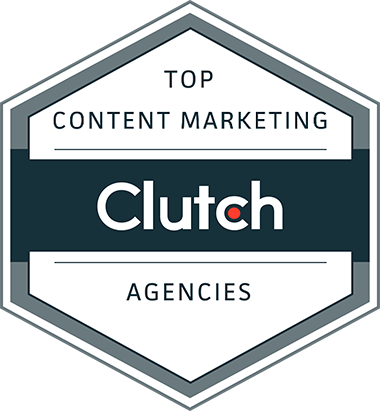 For the first time, we are releasing this information to the marketing community. Here’s what we found. Our analysis found a correlation between domain authority and sentiment score. 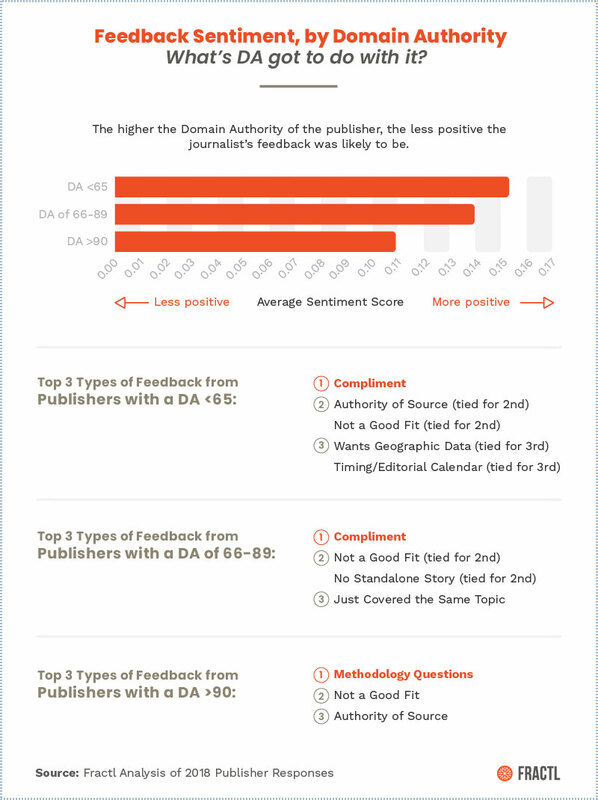 The lower the Domain Authority of the publisher, the more positive the journalist’s feedback was. Anyone who’s been pitching publishers for a while will immediately recognize why. Top tier publishers with a Domain Authority of 90 are usually well-known, highly trafficked news sources for the public. This top-tier group contains established publishers such as the New York Times, CNN, TIME, and The Washington Post. All of these publishers have strict editorial guidelines and therefore are notoriously difficult to pitch. When the journalist does respond, they usually want to know more about the methodology or ask for an expert interview for their article. They want their article to be as authoritative as possible if they’re writing for one of these top-tier publications. They’re likely to be straight-to-the-point in their reply because they’re busy and want to make sure your content is worth their time. When we analyzed feedback from websites with a Domain Authority of less than 90, the top feedback we received from journalists were complimenting our work. TL;DR: The higher the Domain Authority the publisher has, the more rigorous their editorial standards are. The least positive responses came when the journalist thought the content was not newsworthy, had questions about the source, or had just covered the same topic recently. That being said, none of the responses averaged below zero, meaning they were all written with positive language, not negative. In our analysis, we found that contributors are more positive than staff editors and staff writers. This is likely because they’re not restricted to a single beat and receive fewer pitches than an editorial staff would field in the same time frame. While they may be the most positive on average than other roles, they have less deciding power when it comes to determining which content gets covered. 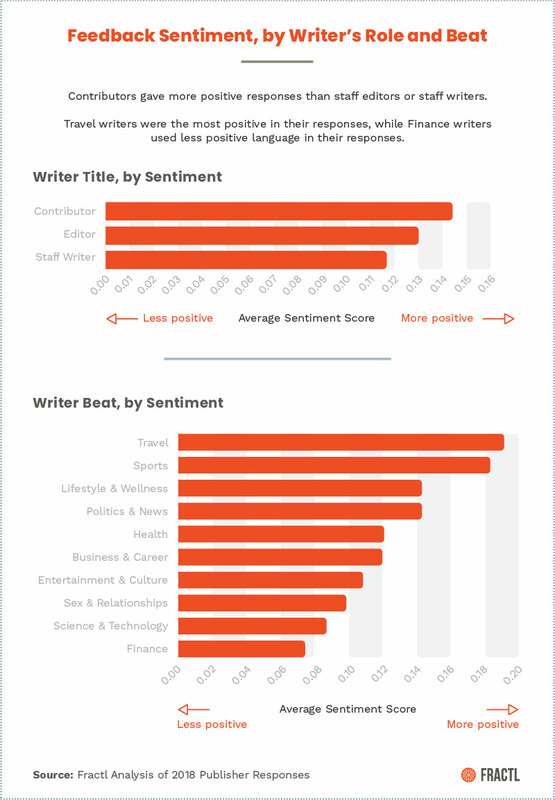 When it comes to specific beats, we found that feedback from travel writers was the most positive on average, while finance writers were less positive in their responses. While travel is a fun, lighthearted topic, finance journalists often write articles and give advice to readers, which is why they may be more scrutinizing when offered financial content. 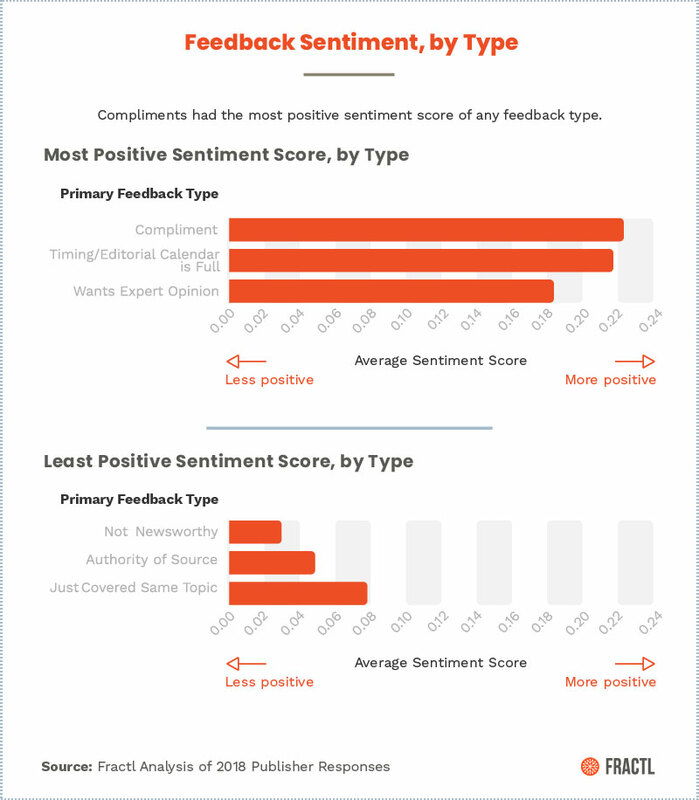 To analyze these responses, we used a language sentiment API to determine if a response from a journalist was more positive or more negative. After reviewing feedback from 2018, none of the scores in this report actually averaged as “negative”. All of the assets show feedback on a positive scale. The closer the sentiment score is to approaching 1, the more positive it is, the closer it is to approaching 0, the less positive it is. We recorded 291 journalist responses to our content campaign pitches from 2018. Then using TextBlob, a Python library that performs language processing, we determined the sentiment of the text. Sentiment is an analysis of how positive, neutral, or negative something is. It’s based on a score of -1 to 1, with -1 being extremely negative, 0 as neutral, and 1 being extremely positive. This tool is based on a pre-existing text analysis library and therefore we were not able to customize the dictionary used to analyze this text. No statistical testing was performed, so the claims listed above are based on means alone. As such, this content is purely exploratory. For “Feedback Sentiment, by Writer’s Vertical”, verticals with fewer than thirteen records were excluded.